Data are discrete symbols that represent facts. You might think of them as recordings or statistics. There is no meaning or significance beyond the data’s existence. Data may be clean or noisy; structured or unstructured; relevant or irrelevant. Information is data that has been processed to be useful. I like to think of it as adding the first bit of context to data relating to “who”, “what”, “where”, and “when”. Information captures data at a single point in time and from a particular context; it can be wrong. 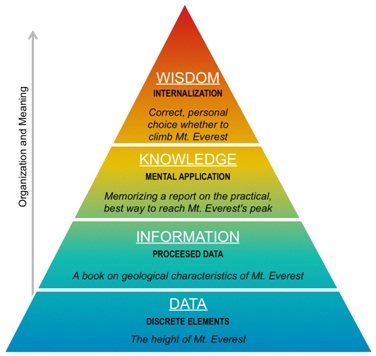 Knowledge is the mental application of data and information. Most consider this as addressing questions around “how”. Some consider knowledge a deterministic process, which is to say the appropriation of information with the intent of use. Wisdom is the evaluation and internalization of knowledge. It applies insight and understanding to answer “why” and “should” questions.